Join us for our March event at Le Café by Vesuvio! Entrance fee includes 1 complimentary welcome drink of wine, beer or a soft drink, as well as, slices of pizza, a raffle ticket and a live singer! The raffle prize will be surprise until announced later in the evening! 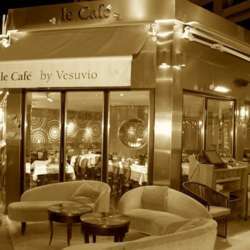 Le Café by Vesuvio offer a menu at 22 eur (wine, fish, meat or vegan desert). This can be booked directly with Cafe Vesuvio via: 0493437094. People that book the menu can go straight to the restaurant and come later to collect ticket to avoid long lines.